This topic addresses the use of botulinum toxin injections to treat neurogenic detrusor overactivity (NDO). Various neurologic conditions may cause detrusor overactivity and urinary incontinence. In select conditions, such as spinal cord injury, the attendant risk of upper tract deterioration exists as a result of pyelonephritis and increased intravesical pressure as a result of poor bladder compliance and detrusor sphincter dyssynergia. Initial management of patients with detrusor overactivity related to a neurologic condition consists of behavioral therapy, when feasible, and anticholinergic therapy. In those patients with increased postvoid residuals, clean intermittent catheterization is often used in conjunction with anticholinergic therapy. However, the side effects of anticholinergic therapy have led to poor compliance with long-term use. In attempts to improve the efficacy and tolerability of anticholinergic therapy, several newer therapies have been developed that are available in sustained-release formulations and variable doses. Despite these modifications, patients whose response to anticholinergic therapy may be unsatisfactory in terms of either efficacy or tolerability exist. Historically, such individuals were faced with more invasive surgical interventions to lower detrusor pressure or promote continence, including bladder augmentation. Bladder augmentation is not without significant long-term risks, including infections, stones, malignancy, and perforation. A form of botulinum toxin A known as onabotulinumtoxinA (BOTOX; Allergan, Irvine, CA) has been approved by the US Food and Drug Administration (FDA) for the treatment of urinary incontinence due to NDO in adults who have an inadequate response to or are intolerant of anticholinergic therapy. Botulinum toxin A blocks neuromuscular transmission by binding to acceptor sites on motor or sympathetic nerve terminals, entering the nerve terminals, and inhibiting the release of acetylcholine. The inhibition occurs as the neurotoxin cleaves synaptosomal-associated protein 25 (SNAP-25), a protein critical to the successful docking and release of acetylcholine from presynaptic vesicles located within the nerve endings. When injected into the muscle at therapeutic doses, botulinum toxin A produces partial chemical denervation of the muscle, resulting in a localized reduction in muscle activity. In addition, the muscle may atrophy, axonal sprouting may occur, and extra junctional acetylcholine receptors may develop. Evidence exists that reinnervation of the muscle may occur, thus slowly reversing the muscle denervation produced by botulinum toxin A. The adult bladder is located in the anterior pelvis and is enveloped by extraperitoneal fat and connective tissue. It is separated from the pubic symphysis by an anterior prevesical space known as the retropubic space (of Retzius). The dome of the bladder is covered by peritoneum, and the bladder neck is fixed to neighboring structures by reflections of the pelvic fascia and by true ligaments of the pelvis. 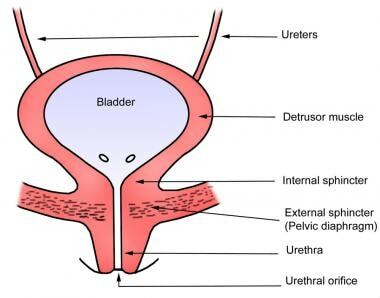 The body of the bladder receives support from the external urethral sphincter muscle and the perineal membrane inferiorly and the obturator internus muscles laterally (see the image below). Intradetrusor injection of onabotulinumtoxinA is approved by the FDA for the treatment of urinary incontinence due to detrusor overactivity associated with a neurologic condition in adults who have an inadequate response to or are intolerant of an anticholinergic medication. Clinical trials have been performed in patients with multiple sclerosis and spinal cord injury. In such individuals, botulinum toxin A was used as monotherapy or in conjunction with anticholinergic therapy. More recently, onabotulinumtoxinA has been approved for the treatment of overactive bladder in patients who are refractory to or intolerant of anticholinergic agents. OnabotulinumtoxinA is contraindicated in the presence of infection at the proposed site(s) and in individuals with known hypersensitivity to any botulinum toxin preparation or to any of the components in the formulation. It is also contraindicated in patients with detrusor overactivity associated with a neurologic condition who have an acute urinary tract infection, as well as in patients with acute urinary retention who are not routinely performing clean intermittent self-catheterization (CIC). Potential drug interactions must be taken into account. Patients receiving concomitant treatment with onabotulinumtoxinA and aminoglycosides or other agents interfering with neuromuscular transmission (eg, curare-like agents) or muscle relaxants, should be observed closely because the effect of onabotulinumtoxinA may be potentiated. Potential transmission of viral disease must also be considered. OnabotulinumtoxinA contains albumin. On the basis of effective donor screening and product manufacturing processes, onabotulinumtoxinA carries an extremely remote risk for transmission of viral diseases. A theoretical risk for transmission of Creutzfeldt-Jakob disease (CJD) is also considered extremely remote. No cases of transmission of viral diseases or CJD have ever been reported for albumin. In this study, 75 patients were enrolled and randomized to receive 100, 150, or 200 U botulinum toxin-A injected suburothelially at 40 sites. Of the 75, 40 had NDO. Of these 40, 22 had chronic cerebrovascular accidents or Parkinson disease and 18 a spinal cord injury or multiple sclerosis. All patients voided by reflex or abdominal stimulation and had baseline postvoid residual volumes smaller than 150 mL. When patients with NDO were compared with those with idiopathic detrusor overactivity (IDO), the former had significantly greater rates of excellent (patient achieved continence with a voiding difficulty grade increased by less than 2) and improved (incontinence grade improved by 1 or more points compared to baseline and voiding difficulty increased by less than 2) results (97.5% versus 77.1%). When NDO and IDO patients were considered together, cystometric bladder capacity at 1 month increased by 1.8 times, 1.73 times, and 1.56 times the baseline value for patients treated with 200, 150, and 100 U of botulinum toxin A, respectively; capacity at 3 months increased by 1.5, 1.4, and 1.3 times the baseline value. Mean postvoid residual volume increased by 3-4 times the baseline value at 1 month in all treatment groups and remained significantly increased at 3 months in patients who received 150 and 200 U of botulinum toxin A. In this study, 59 patients (53 with SCI and 6 with multiple sclerosis) with NDO and incontinence requiring clean intermittent catheterization were randomized to either 200 or 300 U of botulinum toxin A or to placebo. Endpoints included changes in daily frequency of urinary incontinence episodes (primary endpoint), urodynamic parameters, and impact on quality of life (QoL) as determined by the Incontinence Quality of Life questionnaire. Significant posttreatment decreases in incontinence episodes from baseline occurred in both treatment groups but not in the placebo group. Significant decreases in incontinence episodes at all time points were seen in the 2 botulinum toxin A groups (except for weeks 12 and 18 in the 200 U group) but not in the placebo group. Compared with placebo, the difference between treatment groups was significantly in favor of the 300 U group at weeks 2 and 6 and the 200 U group at week 24. Anticholinergic use remained similar throughout. The mean maximal cystometric bladder capacity increased significantly from baseline in each botulinum toxin A treatment group at all posttreatment time points, although no significant changes were noted in the placebo group. Mean changes from baseline in the 2 treatment groups were significantly higher as compared with the placebo group at every time point except week 24 in the 300 U group. The overall incidence of patients experiencing at least 1 adverse event was not significantly different among the treatment groups, and no such events were considered to be related to the study group. No cases of autonomic dysreflexia were noted. In this study, 25 patients were randomly assigned to receive either resiniferatoxin 0.6 µM diluted in 30 mL of 0.9% sodium chloride or intradetrusor injections of botulinum toxin A 300 U diluted in 30 mL 0.9% sodium chloride. Patients were asked to decrease the daily dosage of anticholinergics within 15 days of the beginning of treatment. The frequency of incontinence episodes in the botulinum toxin A arm significantly decreased compared with the resiniferatoxin arm at 6, 12, and 18 months’ follow-up. In addition, the uninhibited detrusor contractions threshold and the maximum bladder capacity significantly increased; the maximum pressure of uninhibited detrusor contractions in the botulinum toxin A arm significantly decreased as compared to the resiniferatoxin arm at 6, 12, and 18 months’ follow-up. The investigators did not identify any local side effects during and after intradetrusor injections. One patient experienced mild asthenia soon after the first treatment, which persisted for 10 days. Seven patients in the botulinum toxin A arm continued to take anticholinergics during follow-up, but the dosage was decreased by an average of 62.5% compared with 10 patients who continued anticholinergic therapy during the entire observation; dosage in the resiniferatoxin group decreased by an average of 56.4%. Of the patients in this study who underwent detrusor botulinum toxin A treatment, 99 (72%) returned for a second treatment; 47, 25, 14, and 5 returned for retreatments 3, 4, 5, and 6, respectively. Impact on QoL was assessed by means of the Urogenital Distress Inventory (UDI-6), the Incontinence Impact Questionnaire (IIQ-7), and the EuroQol-5 Dimensions questionnaires before and 4 weeks after botulinum treatment. The mean UDI-6 and IIQ-7 scores showed considerable improvement 4 weeks after each treatment, even when repeated 6 times. The mean differences in UDI-6 and IIQ-7 scores were 38.2 and 46.2, respectively, for injection 1, 33.5, and 40.1 for injection 2, 38.6 and 41 for injection 3, and 33.7 and 41.6 for injection 4. Before the first injection, 65% relied on CIC; after the first treatment, 95% relied on CIC. Apostolidis A, Popat R, Yiangou Y, Cockayne D, Ford AP, Davis JB. Decreased sensory receptors P2X3 and TRPV1 in suburothelial nerve fibers following intradetrusor injections of botulinum toxin for human detrusor overactivity. J Urol. 2005 Sep. 174(3):977-82; discussion 982-3. [Medline]. Kuo HC. Clinical effects of suburothelial injection of botulinum A toxin on patients with nonneurogenic detrusor overactivity refractory to anticholinergics. Urology. 2005 Jul. 66(1):94-8. [Medline]. Tullman M, Chartier-Kastler E, Kohan A, Keppenne V, Brucker BM, Egerdie B, et al. Low-dose onabotulinumtoxinA improves urinary symptoms in noncatheterizing patients with MS. Neurology. 2018 Aug 14. 91 (7):e657-e665. [Medline]. Schurch B, de Seze M, Denys P, Chartier-Kastler E, Haab F, Everaert K. Botulinum toxin type a is a safe and effective treatment for neurogenic urinary incontinence: results of a single treatment, randomized, placebo controlled 6-month study. J Urol. 2005 Jul. 174(1):196-200. [Medline]. Giannantoni A, Di Stasi SM, Stephen RL, Bini V, Costantini E, Porena M. Intravesical resiniferatoxin versus botulinum-A toxin injections for neurogenic detrusor overactivity: a prospective randomized study. J Urol. 2004 Jul. 172(1):240-3. [Medline]. Kim SW, Choi JH, Lee YS, Han SW, Im YJ. Preoperative urodynamic factors predicting outcome of botulinum toxin-A intradetrusor injection in children with neurogenic detrusor overactivity. Urology. 2014 Dec. 84 (6):1480-4. [Medline]. Peyronnet B, Castel-Lacanal E, Manunta A, Roumiguié M, Marque P, Rischmann P, et al. Failure of botulinum toxin injection for neurogenic detrusor overactivity: Switch of toxin versus second injection of the same toxin. Int J Urol. 2015 Sep 22. [Medline]. Khan S, Game X, Kalsi V, Gonzales G, Panicker J, Elneil S. Long-term effect on quality of life of repeat detrusor injections of botulinum neurotoxin-A for detrusor overactivity in patients with multiple sclerosis. J Urol. 2011 Apr. 185(4):1344-9. [Medline]. Kalsi V, Apostolidis A, Popat R, Gonzales G, Fowler CJ, Dasgupta P. Quality of life changes in patients with neurogenic versus idiopathic detrusor overactivity after intradetrusor injections of botulinum neurotoxin type A and correlations with lower urinary tract symptoms and urodynamic changes. Eur Urol. 2006 Mar. 49(3):528-35. [Medline].